Right from the start of the lively opening scene, in the recent Victory Players production, it was clear we were in for a very enjoyable evening. The story of the self-satisfied, incorrigible, Henry Higgins, and his transfiguration of the lowly flower girl, Eliza Doolittle, into a ‘lady’ was a constant joy. Eliza, played by Charlie Marshall, has a captivating stage presence and a beautiful singing voice. Her cockney speech was a delight, and the amusing way she transformed it into something more ‘posh’ was skillfully done. Higgins, played by Charles Metcalfe in good voice, was equally outstanding. He captured the nature of the insensitive professor to perfection, always talking about Eliza in the third person, but going into a huff when she turned the tables on him. Although, he did start to realise how much she meant to him after she left. 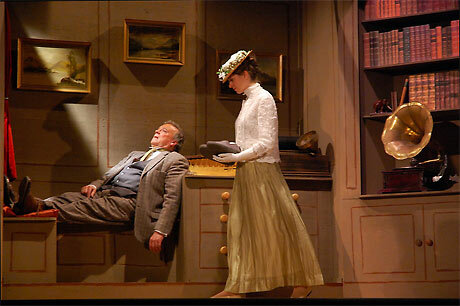 Eliza’s father Alfred Doolittle, played by John Bunn, was terrific. The stage came alight when he appeared, with his voice filling the hall. Colonel Pickering, Douglas Wragg, was suitably lower key in his efforts to keep the peace and treat Eliza with courtesy. It is not how she behaves that matters, but how she is treated. Space prevents me from mentioning all the other players, but they interpreted their characters with gusto and sang their hearts out. There are other congratulations too. May I pick out David Moore as pianist and musical director; also the set designers and builders, enabling all the scene changes to be conducted so smoothly. The costumes were wonderful and so was the choreography. But perhaps my greatest praise must go to the Director, Keith Major: what a tremendous set of performances he achieved. Most of us will have known the songs and the story already, but probably never expected to hear and see such an extravaganza in the Victory Hall. The rain may be falling in Spain, but the sun certainly shone in Balcombe! 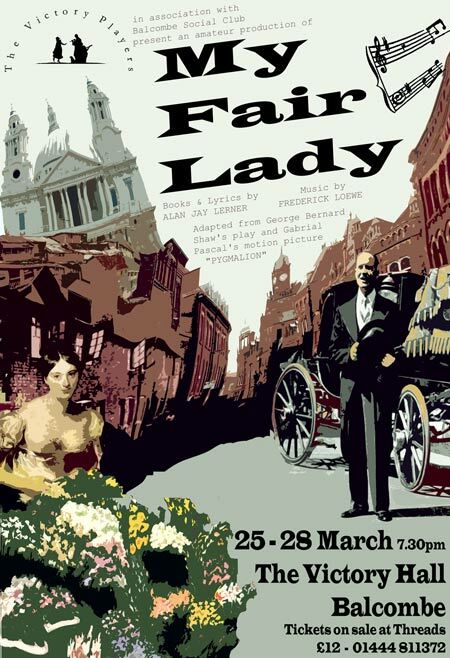 A REVIVAL of the timeless musical My Fair Lady by the Victory Players in Balcombe was a gem of first class acting, singing and stage production. Former professional singer Charles Metcalfe was magnificent as the irascible Professor Higgins whose heart finally melts to the hidden charms of his protégé Eliza Doolittle. His unreasonable, patronising and chauvanistic treatment of the former flower girl with the hideous pronounciations, was a cleverly crafted combination of elitism and underlying naivety that finally spells the end of the professor’s acclaimed batchelorhood. In lengthy scenes of dialogue Mr Metcalfe, Douglas Wragg as his more charming side-kick Colonel Pickering, and Isabel Gordon as the down to earth housekeeper Mrs Pearce were a daunting team. They were complemented further by the shining talent of Charlie Marshall as Eliza who switched apparently effortlessly, and equally demandingly, from rasping Cockney to the rounded vowels of the Queen’s English. The costumes of flamboyant and feathery hats for Ascot and satin gowns for the ball in the presence of the Prince of Transylvania were as good as you would get anywhere, while the skillfully designed set of rotating walls for study/Covent Garden/Ascot were also masterful. With a smoothly directed supporting cast, including particularly, Stanley Holloway-lookalike John Bunn as Eliza’s opportunist father Alfred Doolittle, this was another mammoth production at the Victory Hall in Balcombe that the village amateur dramatic company will, undoubtly, be rightly proud of. The production was a sell out over four nights showing to 120 people each night. 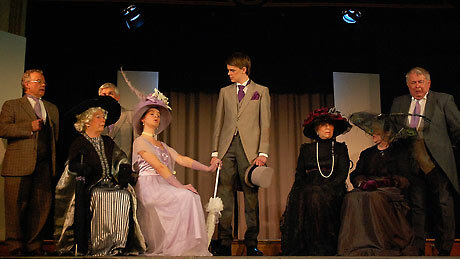 More photographs from My Fair Lady are available from The Victory Players Flickr Photostream. Click HERE to download A PDF version of the programme (to save, rightclick and select "save target as").